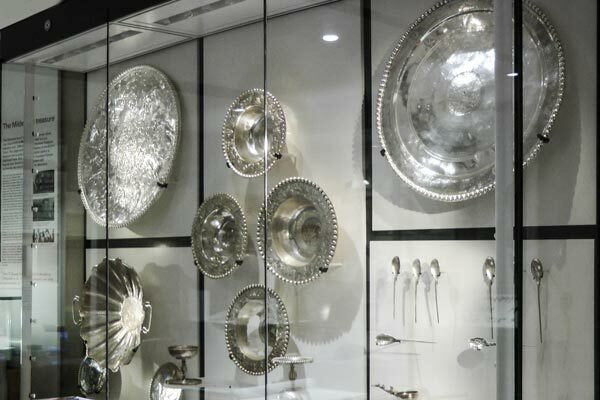 THE MILDENHALL TREASURE comprises over thirty items of silver tableware dating from Roman Britain, including platters, spoons, goblets and bowls, most of it richly decorated. 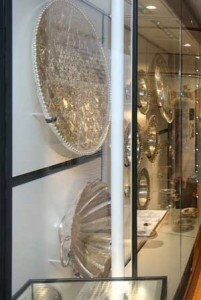 Because of its immense value, the Mildenhall Treasure is housed in the British Museum. Our authentic replicas give an idea of the scope and splendour of this magnificent collection. What does the treasure consist of? The Great Dish is the most spectacular. At 60.5cm (almost 2ft) in diameter, it weighs 8.256kg (over 18 pounds). Its finely executed reliefs show a band of dancing, drunken revellers including Hercules, Pan, and Bacchus, the god of wine. An inner frieze depicts sea monsters and nymphs. The face of a sea-god (Neptune or Oceanus) stares out from the centre. Two smaller platters, probably from the same workshop, bear similar themes of revelry. 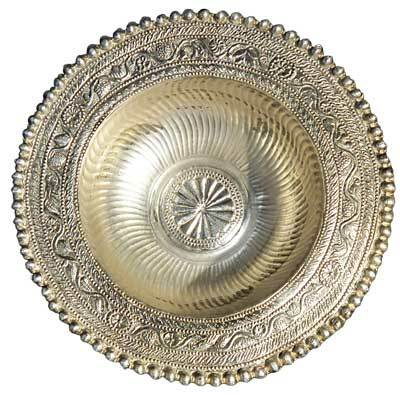 Another large dish, 55.6cm (almost 22 inches) across, has intricate, engraved, geometric designs picked out with black niello (silver sulphide) inlay. Of the six flanged bowls, four have reliefs figuring people and animals; the other two have richly decorated rims and bowls. The covered bowl has leafy designs on the flanged rim. Its high, domed cover, decorated with leaves and a frieze of wild animals and human heads, originally belonged to another bowl. A pair of goblets with shallow bowls, moulded stems, and leaf decoration under each broad base may have doubled as stemmed platters when turned upside down. A fluted bowl 40.8cm (16 inches) in diameter, with alternating plain and foliate panels, has swinging handles, whose looped ends are shaped like swans’ heads. Four silver-gilt handles cast in the shape of dolphins were once soldered to the five ladel bowls. There are also eight spoons. Of these, seven have pear-shaped bowls. Three bear leafy decoration resembling that of the fluted dish. The rest are inscribed. Of these, three are almost identical, having the Christian Chi-Rho symbol between Alpha and Omega engraved in the bowl. The last two carry names and may be christening spoons: one (the only spoon with an oval bowl) reads PAPITTEDO VIVAS (long life to Papittedus), the other PASCENTIA VIVAS (long life to Pascentia). Who found the treasure and when? On a bitter January afternoon in 1943, during the dark days of World War II, ploughman Gordon Butcher unearthed a big metal dish at West Row. He fetched his boss, Sydney Ford, an agricultural engineer who collected local antiquities. They returned to the field. As snow began to fall, they dug out more dishes, bowls and spoons. To their amazement they uncovered 34 items in all. Black with age, they looked like pewter or lead. In the fading light Ford stuffed the finds into a sack and took them home. A few were bent. Ford had one of his workmen straighten them out, then he put them on the mantelpiece. After the war, a chance visitor realised that Ford’s ‘pewter’ was really Roman silver. The coroner was told and an inquest held.The hoard was declared Treasure Trove on July 1st 1946 and became Crown property. Newspapers speculated that the find was worth £50,000, a huge sum for the time. Ford and Butcher shared a reward of £2,000. Because Ford delayed reporting the find, they did not receive the full market value. The Treasure was acquired by the British Museum where it can be seen to this day. When spectacular finds are not reported straight away, people get suspicious and rumours start. A small Roman building with under floor heating once stood near the find-spot, but is that just a coincidence? A persistent local story tells that the Mildenhall Treasure was larger, that it was first discovered elsewhere, and that a few items were sent abroad before the rest were reburied where Ford and Butcher found them. The very lack of evidence fuels speculation. If there is truth in any of the stories, it is unlikely that we shall ever know. Almost all the silver and gold hoards in East Anglia were buried in the late 4th century AD. History tells of considerable unrest, Saxon pirates were menacing south­eastern Britain from the sea. Pictish and Scottish marauders were harassing the province from the north. Religious conflict rocked the Empire when the emperor Julian the Apostate (360-63AD) tried to turn back to paganism from Christianity. The Empire itself was beginning to break up. It is small wonder that the wealthy buried their riches for safe keeping. We can only guess what disasters kept them from recovering their goods. Archaeology tells us that the fen edge was well populated and prosperous in Roman times. The fens provided wild­fowl and fish. The land was good for growing crops and raising sheep. Grain and wool made the area wealthy. Two major roads, the Icknield Way and the Peddars Way, linked East Anglia to the rest of Britain. Fen rivers led to the sea, highway to the Empire. The Mildenhall area appears to have shared in the prosperity. Several coin hoards have been found, and an excavation at Beck Row in the spring of 1999 revealed traces of a very large timber building, perhaps a barn or grain store for a big farming estate. Further evidence of East Anglia’s wealth comes from 3rd and 4th century hoards: silver from Mildenhall and Water Newton (near Peterborough); the gold and silver Thetford Treasure; gold and silver jewellery from a jeweler’s workshop at Snettisham, Norfolk, and the early 5th century Hoxne hoard of more than 14,000 gold and silver coins, tableware and jewellery, excavated in 1992.
Who owned the Mildenhall Treasure? The hoard is very high quality. It contains a lot of silver and bears Christian symbols. The owner was apparently a very wealthy Christian, probably someone important. Some experts have suggested the general Lupicinus, who was sent from Gaul by the pagan Emperor Julian in 360AD to quell barbarian attacks in Britain. Could the Great Dish have been a gift from the emperor himself? We know that Lupicinus was recalled to Rome, where he fell from favour and was arrested. If the treasure were his, (and we will never know for sure) he was never able to return and collect it.